Polybag comes filled with 45 boulder size (1 3/8") glass marbles in assorted colors and styles. 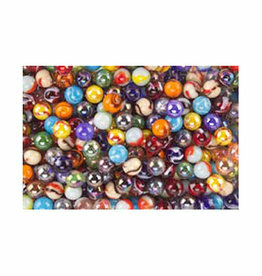 Polybag comes filled with 25 mammoth size (1 5/8") glass marbles in assorted colors, styles and finishes. bag contains approximately 3 or 4 different styles. Polybag comes filled with 500 player size (5/8") glass marbles in assorted colors, styles and finishes. bag contains approximately 4 or 5 different styles.